Brenda Sandberg, director of the City of Erie's Department of Economic and Community Development, will replace longstanding Port executive director. What does it mean for Keystone State's only port? The Port of Erie could very well be the region's most important resource. It provides a critical aesthetic to the bayfront and lakefront that governs the way visitors – both native and foreign – think about this community. It also serves one of the most legitimate economic development functions in Northwest Pennsylvania. This critical resource is primarily governed by the Erie-Western Pennsylvania Port Authority. A change in power at that organization could be seismic, affecting the Port's industrial and community landscape. Port Authority Executive Director Ray Schreckengost announced his retirement in July and will leave the post on Oct. 31. "He's a tough guy to replace," says Jeff Johnson, chairman of the Port Authority board of directors, of the man who's filled the post since 1994. Schreckengost was a prominent and sometimes controversial figure, and his decisiveness about the form and function of bayfront development sometimes took an adversarial tone. But such controversy isn't outside the scope of that position. On Tuesday, Aug. 26, the Port Authority board of directors announced that Schreckengost would be replaced by Brenda Sandberg, director of the City of Erie's Department of Economic and Community Development. The board began its search for Schreckengost's replacement in July by publicizing the opening in local media and "a number of publications," according to Johnson. The search yielded only eight applicants, all from Pennsylvania. "Three were from Harrisburg – two of whom were from Erie and wanted to return – one was from Philadelphia and the others were local," says Johnson. The region has experienced a dearth of applicants for executive positions at public institutions in recent years. County Executive Kathy Dahlkemper, and her predecessor Barry Grossman, asked County Council for wage increases for top positions in county government – including warden of the Erie County Prison – in order to attract a more competitive pool of qualified candidates. Salaries for executive directors at other Great Lakes port authorities range from $108,000 to $300,000, according to published reports. Sandberg will earn an annual salary of $95,000 at Erie's Port Authority. Most executive directors at member ports of the American Great Lakes Ports Association – which includes the Erie-Western Pennsylvania Port Authority – have extensive experience in port operations, engineering, and business administration. Sandberg's experience is primarily in urban planning and economic development. Nevertheless, Johnson contends that Sandberg's experience and temperament qualify her for this job. "She knows how to deal with the public. She'll handle the job," Johnson says. Before working in economic and community development for the Sinnott Administration, Sandberg was the CEO of the Erie Downtown Partnership. Both roles gave her extensive experience with grant writing, which the Port Authority board identified as a key criterion in its search to replace Schreckengost. "I see the work of the Port Authority as such a huge economic driver," says Sandberg. "It's a natural transition. I've worked with developers on the zoning side, with downtown business owners, and this office (economic and community development) does a lot of grant seeking, so this is the perfect package." The Port Authority board of directors has several priorities, including infrastructure improvements to the Liberty Park amphitheater, but it also wants to see more development of industrial shipping needs. "The industrial end of the Port of Erie is of critical importance," says Johnson. "Fifteen locomotives recently went to Mozambique from the Port of Erie. We need to do more of that. Brenda has the financial background. She knows how to write grants, and she's been inside the political ring and has contacts at the State and Federal levels." 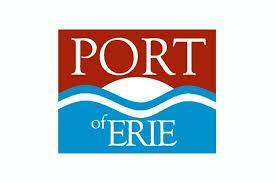 The Port of Erie will play as important a role in Erie's future as it has in its past. It will require dynamic leadership that can move the region forward without alienating the community and its needs with regard to waterfront access and related amenities. "It's a tricky balance," Sandberg says. "The port – being the keeper of the bayfront master plan – can work with developers to work their way through what makes economic business sense to them while respecting what our community's need is." Sandberg leaves her job at city hall on Sept. 5 to serve as assistant executive director of the Authority. She officially takes the reigns from Schreckengost on Nov. 1.